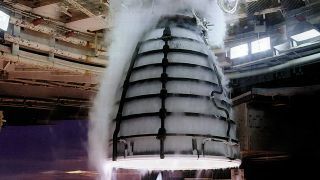 NASA fired off a test of its RS-25 engine, what it calls the "Ferrari of rocket engines," at 2 pm PT/5 pm ET/10 pm GMT today, and initial results indicate it was a success. The space agency provided a live feed to the action at Stennis Space Center in Mississippi on its website, giving the public an up-close, visceral look at the sheer power of the RS-25. The liquid-hydrogen burning RS-25 is a whole new rocket, which NASA calls "one of the most complex and efficient rocket engines in the world." It's part of the NASA's plan to send humans to Mars, asteroids and beyond: implemented in the new Space Launch System, four RS-25s will power the core stage of launches. Today was the sixth of seven static fire tests, and NASA wanted to gather intel on how the engine's new controller performs during this run. The agency also wanted to put the engine through the paces of more extreme start conditions than would be expected during flight. The test lasted 535 seconds (or about nine minutes), with the engine itself running for about eight minutes.